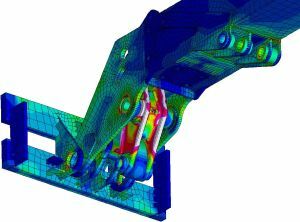 Stress Analysis is the most basic form of FEA and has many advantages compared to conventional hand calculations. Rather than reducing complex structures to simplified models, FEA permits the entire structure to be analysed, thus enabling a better understanding of the load distribution, displacement and stress state. Static stress analysis is the first step in the understanding a structure’s overall behaviour and helps to verify more complex analysis. Frequently, non-linear materials (rate dependent, hyperelastic,….) and non-linear geometry effects (i.e. large deflections) are included in the analysis in order to reflect more realistic structural behaviour. Fatigue, plasticity, material creep, structural instability and assembly staging (structural birth and death) are also further analysis techniques required for more advanced analysis problems. Pure thermal analysis or coupled with linear/non-static effects are also undertaken. Often, stresses and strains predicted in FEA or stress analysis need to be verified and calibrated using data acquisition or actual measurements taken on the structures when subjected to real-life loadings.